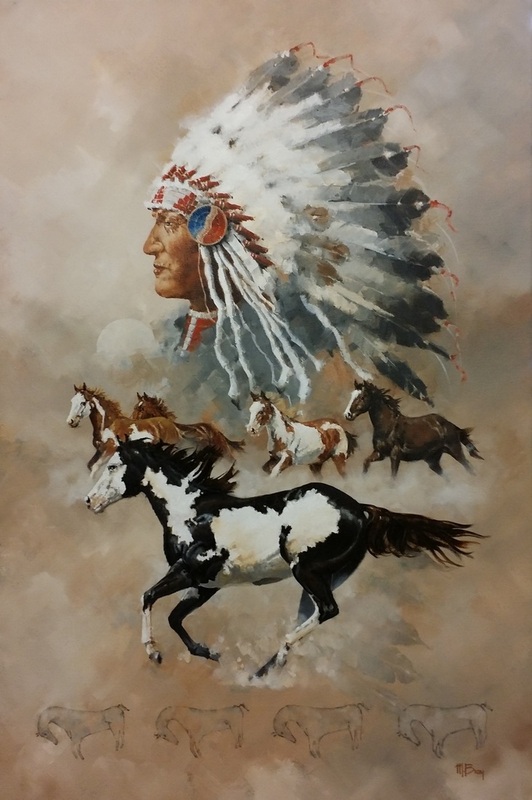 ﻿﻿This painting is about the introduction of the horse to the Native American, specifically the Comanche - noted as the first Native American tribe to witness the Spanish riding these beasts. Not knowing what they were, the Comanche referred to them as "magic dogs". It wasn't long before they had acquired their own and in time became the west's most talented and feared horsemen. The introduction of the horse to our continent dramatically changed the way the Indians lived and really accelerated our own population explosion westward. I've added a nod to our pre-historic past by including a likeness of the Comanche's Blue Horse Petroglyph - thought to have been carved long before the Spanish brought the horse to North America. Juried into the "2017 Western Spirit Art Show and Sale" Held at the Old West Museum in Cheyenne, WY.